A custom diamond mother’s ring made of white and rose gold has a terrific story behind it. When Julie tragically lost her young husband several years ago, after six months of marriage, she wasn’t ready to put her wedding ring away. She continued wearing it on her right hand to honor her short marriage. Well, life has a way of going on, and Julie found herself in a new relationship. And while she didn’t want to look married, she also didn’t want to change it too much. She was living in Columbus, OH at the time, and stopped in our store, Scott’s Custom Jewelers, to talk about custom jewelry options. She met with our son, Zack, and told him her story. She loved what we could do, but she unfortunately, was moving. To Akron! So she decided to settle into the area first and visit our Fairlawn, OH store after the move. A few months later, she made an appointment and showed up with her gorgeous newborn baby daughter (seriously, the baby could be a model, she’s that stunning!) We talked about what she loved about her ring, and what she wanted to change. Her original wedding set contained a pretty diamond halo band, with more diamonds on the sides, and two, matching diamond wedding bands. I came up with the idea of creating a custom mother’s ring, using multiple bands and incorporating her daughter’s birthstone, which was sapphire. *Just a side note – did you know that sapphires come in every color of the rainbow? And they are extremely hard, almost as hard as diamonds, which make them very good for rings. That’s why in Europe, sapphires, like the famous Princess Diana/Duchess Kate ring, are more popular than diamonds for engagements. Scott came over to goo at the baby, and suggested that we simply separate the wedding bands from the set, and use them in the multi-band design. Not only would it save a lot of money (which we all love), but would also honor Julie’s marriage. 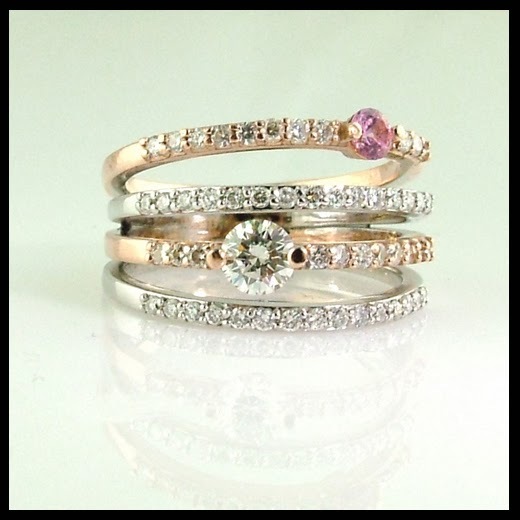 We decided to use lovely rose gold for the other two bands, and put a pink sapphire (for the baby) and the engagement diamond on them, along with all of the extra halo and side diamonds from the engagement ring. The finished mother’s ring was amazing. Julie said she loved that she could still see her original wedding rings in the piece, and the addition of her daughter’s birthstone made it seem even more personal to her. And now her story could continue. It’s always about the story.